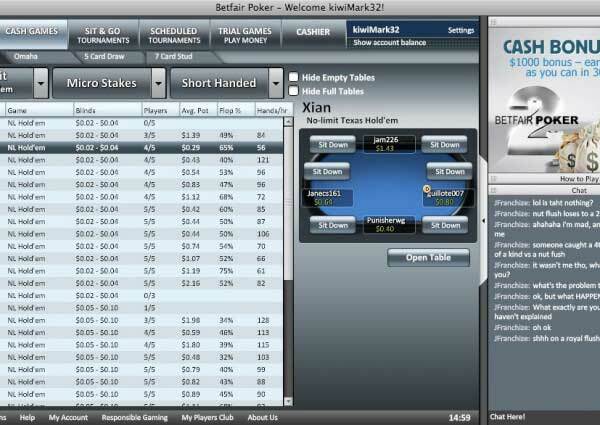 Betfair offers one of the more diverse gaming experiences out there, covering sportsbetting, poker, and casino games. Each of these has their own distinct bonus offer, some of which are rather good. Each of these bonuses must be activated individually, as Betfair does not allow players to transfer their funds from one part of their site to another. In other words, they do not offer a shared wallet and you have to make a separate deposit on each channel. Betfair allows multiple bonuses across their channels! In other words, you are able to claim the poker deposit bonus along with the casino. NUTS: Betfair allows players to choose from a variety of poker bonuses. This allows players of all levels to find an offer that’s right for them. BEATS: There aren’t too many downsides to the Betfair poker bonus. The only thing that could trouble some is the time limit, which is set at 60 days. 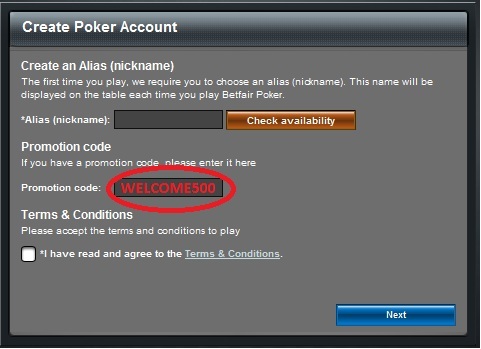 Use the Betfair Poker Promotion Code WELCOME500 when you register a new account to activate the bonus described below. As shown above, the clearing requirements for each are a bit different. As with most online poker bonuses, players will need to collect points in order to clear the cash. At Betfair, this is accomplished through either ring game rake (3.6 points for each $1) or tournament fees (3.6 points for each $1). The difference is the amount of points needed and the release rate, based on the bonus you choose. Timing limits are set at 60 days for each offer except for the $50, which allows its players 90 days to clear the promotion. So what bonus you choose really depends on you. You need to weigh how much time you have to dedicate, the size of your bankroll, and the amount of hands you can play in the clearing period. We think that for most players, the $500 bonus is the best option, but again, this may vary. Taken as a whole, the Betfair Poker bonus earns a 4 out of 5, thanks to its variety of tiers. 100% up to £200 — Automatic bonus with our links! NUTS: Betfair’s Casino Bonus is divided over a player’s first three deposits, which affords a greater measure of flexibility. 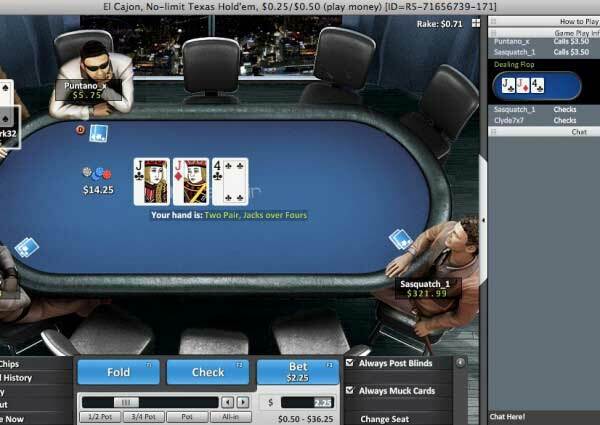 BEATS: With all the choices available to Betfair’s poker players, one would have liked to see a nlittle more variety for the casino customers. The limited amount of games that can be used toward the bonus are also troublesome. There is no Betfair Casino Bonus Code to be entered, the bonus is Automatic with your first deposit. Unlike the poker offer, the Betfair Casino bonus comes in only a single flavor – a 100% up to £200 match bonus spanning a player’s first three deposits. Users can earn 100% up to £100 on their initial buy-in, with two 100% up to £50 offers available afterward. These offers are available only to players who have not yet made a deposit in the Betfair Casino, though those who’ve spent time in the poker room or sportsbook will still be eligible. The minimum deposit needed to trigger each bonus is £25, and players are allowed just seven days to to wager 20 times the amount of their combined bonus and buy-in. So, say a player loads up for the maximum of 100% up to £100 on their first deposit. In order to clear this first hurdle, they would need to wager £4,000 over the course of the next week in order to unlock the entire bonus. This is further complicated by the fact that not all of Betfair’s casino games contribute in an identical fashion. Blackjack stakes, for instance, count at a rate of only 20%, as do most varieties of card games and roulette. Slots and Arcade games, in fact, are the lone 100% contributors. Because of these restrictions, the Betfair Casino bonus snags only a 2 out of 5 rating. Free £20 bet, Up to £1,000 Cashback — Automatic bonus with our links! NUTS: Betfair’s loss-free bet and cashback offers are a great way to get new players into their sportsbook. Their multi-tier cashback program is actually one of the best in the business. BEATS: Things can get a little complicated, once a player reads through the entire terms and conditions. There is no Betfair Sports Bonus Code to be entered, the bonus is Automatic with your first deposit. At present, Betfair offers a loss-free £20 bet to their new customers. In order to grab this offer, a player’s wager must be matched for at least £20. If the player loses, that same £20 will be credited back to their account. If they win, then that appears to be all the reward they get. This isn’t where things end for Betfair, however. The company is also offering an interesting cashback promotion which can net players as much as £1,000 over their first 30 days as a site member. This works much like a poker bonus, where users earn varying amounts of player points and unlock cash at a variety of tiers. For each £0.10 of commission paid, players will earn 1 point. This works whether a player wins or loses – all that matters is that they bet. There are ten tiers here, the lowest awarding £10 cashback for those earning between 100 and 249 points. Things climb from there, topping out at the aforementioned £1,000 (which requires some 50,000 points). These bonuses appear to be withdraw-ready as soon as they are applied to a participant’s account, which nets this promotion a 4 out of 5.